Just like several other professions, there are promotional as well as job advancement opportunities for paramedics. It is also good to know that the promotional opportunities within the NHS are expanding generally. So, choosing to be a paramedic will reward you substantially, in terms of the fulfilment that comes with helping to save lives, the ideal salary scale, plus the increasingly expanding promotional and job advancement opportunities. When you’ve fully qualified and acquired experience as a paramedic, you may undergo promotion after two years. A typical promotion at this stage is promotion to become emergency services team leader. So, you can see that career progression as a paramedic within the NHS is rapid. Therefore, do your best to work hard in order to acquire the full qualification and quality experiences that lead to this initial stage of promotion. Senior position in the control room. Within the NHS and in the course of working as a paramedic, one of the great ways to improve your chances for managerial posts is to embark on management qualification courses. Such courses are usually undertaken on a part-time basis. A larger number of the paramedic senior officers have acquired operational experience rising through the ranks. In addition, you can enhance your opportunities for attaining first and second line management posts through a degree qualification in paramedical science. The willingness to relocate must also be there, since it is one of the things that come with occupying higher positions. In recent times, a paramedic’s role is evolving to incorporate clinical-related roles. A typical example is a recent development where paramedics work as ECPs (Emergency Care Practitioners) alongside doctors and nurses. In such cases, a paramedic will be based in hospital accident and emergency units, health centres, minor injuries units, GPs’ surgeries, as well as community hospitals. In some locations, other forms of opportunities for working as a paramedic exist – e.g. 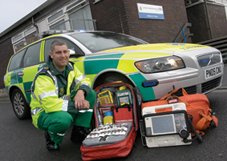 working alone with a rapid response car, motorcycle or air ambulance units. These are known as specialist paramedic work. Obviously, one of the great ways to enhance your opportunities for advancement in the paramedic field is continuing development. This would include further education on health-related areas as may be specified by the HPC, or as deemed fit for the profession. From the foregoing, it is also obvious that promotional opportunities to managerial positions would be enhanced by acquiring managerial qualifications. Luckily, study leaves are usually available within the NHS, for sponsored courses. Do not relent in jumping at such opportunities to prepare yourself for both promotional opportunities and advancement in the paramedic line. Also, you can run your professional development courses on a part-time basis. Check if some financing is available, so that you can take advantage of such financial assistance to cut down on study expenses. If you’ve chosen to become a paramedic, lots of advancement and promotional opportunities await you.